The cowboy spur started life as a small metal spike attached to the foot called a Prick, back in the 11th century. Throughout the centuries, the spur has changed in use and design. Mounted Knights in the medieval ages were awarded them as a sign of their rank. Cowboy Spurs were mainly used to control their steed whilst they were driving cattle across Western America but soon became one of the things Cowboys and Cowgirls were known for and associated with. Modern day Spurs are usually made from aluminum or steel and come is all sorts of different shapes, designs, sizes and uses. Show spurs are popular with folks that want to just wear boot spurs for decorative purposes or as part of a Western Cowboy Costume. Show spurs are also popular with people who might use them as part of a Rodeo or equestrian event. The English Spur is a very basic design and is only used for the control of the horse. Nothing more than a small prick on the end of the heel band, this design is the least flamboyant and is very subtle. Spurs owned by Cowboys and western farm hands today will come from a variety of makers and locations. The once mighty Renalde Spurs Company stopped producing spurs in 1980 when the company closed. Up until that point it was the largest manufacturer of boot spurs in the US - especially after the purchase of the Kelly and Crockett spurs companies. Western Spurs are still worn today by real working Cowboys across America. Their design has not changed much in over 10 centuries and the purpose of the Western Spurs remains the same - to control their horse. Made from 3 main components, the Heel Band connects to the Kneck which sticks out with the Rowels attached on the end which are used to control the steed as required. A cowboy would often have custom spurs made for him based on his own design and style. 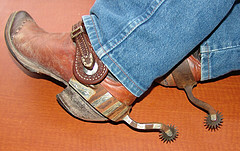 This is more common today where a set of western spurs are often worn as a fashion item by people all over the world.